Few people wake up in the morning and truly appreciate their cable’s strain reliefs. But SNI does. In fact, in working with our key suppliers, we’ve spent a fair amount of time and money to develop an engineered product that will give our phased-array transducer customers added protection and insurance against cable failures. Transducers are electro-mechanical devices that see wear and tear thorough normal usage especially with bending and twisting of the cable and its interface to the probe housing. 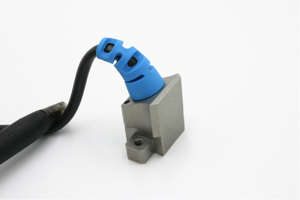 A 128-element array transducer has two ends and 256 solder joints per end or over 500 solder connections per transducer! The key benefit of the new strain relief is the bending relief that it provides. The cables have from 16 -128 micro-coax cables (inner conductor 0.1mm (0.0004”) dia.) that are bent continuously as it is used. The new strain relief is designed to minimize the amount of stress applied to these micro-coax cables and relieve the stress and reduce failure due to breakage. The stain relief is injection molded from a new ExxonMobil non-hydroscopic, specialty thermoplastic. Reducing strain on phased array cables increases cable and array longevity. Strain relief geometry that is tapered and which contains flex grooves. Strain relief material that is soft and bendable. Having the attachment fitting molded right into the strain relief to keep it miniaturized. 16, 32, 64 or 128-element PA UT probes are not inexpensive in that they are hard-wired with a corresponding number of micro-miniature coaxial wires. Each wire has an individual shield and center-core – both of which need to be manually soldered, under a microscope. It’s a labor-intensive process that must be done with a highly-skilled and experience assembler. Sensor Networks, Inc.’s (SNI) is doing everything it can to help its customers extract maximum value from their investments in this important inspection technology. Remember the lowly strain relief! Sensor Networks, Inc. has identified a problem in today’s world: when it comes to complex asset integrity, there are obstacles and challenges that you will face along the way. Where there are problems, innovative solutions should be created to fix them. With that basic mission in mind, Sensor Networks, Inc. was born.